Zach Redmond Ties a Franchise Record in Amerks Win · Let's Go Amerks! Milestones and tying franchise records are a lot more enjoyable when the team wins and the Rochester Americans did just that on Friday night in a 5-4 win on the road against the Wilkes-Barre/Scranton Penguins. Zach Redmond scored two goals to reach 18 goals this season and tie the franchise record for goals by a defenseman in the regular season. The record was set by Rick Pagnutti during the 1972/1973 season. A record that has stood for over 40 years. Have the defenseman been that bad or are Pagnutti and Redmond that good? We’ll go with that good! Redmond started the season with 13 goals in the first 19 games putting him on a direct path to break the franchise record. Things cooled off once Lawrence Pilut was called up and It’d take another 20 games for the next five goals. He’s now in the record books and only needs one more goal in 37 games to take sole possession of the stat. There were two other milestones tonight to mention before getting into the game recap. Wayne Simpson reached 100 career assists in the AHL with a helper on the second goal of the game by Zach Redmond. Dalton Smith played in his 300th AHL game and spent the night doing #DaltonSmithThings (follow us on Twitter). The Amerks are 22-7 when D. Smith plays in a game and 2-6-2-0 when he doesn’t. Let that stat sink in. Back to the game itself…. There’s almost always a few ways to look at a game but in this case we can say that the Amerks played 60 minutes, were perfect on the penalty kill, and scored a power play goal. Those three things are a the cliche keys to success in a hockey game. It wasn’t a perfect game by either side and was won in the third period when the Penguins were down two defensemen. Penguins defender Jeff Taylor had left the game after a hit by Dalton Smith, the reason for Matt Abt leaving is unknown. Either way, playing a game with only four defensemen at any time isn’t ideal. 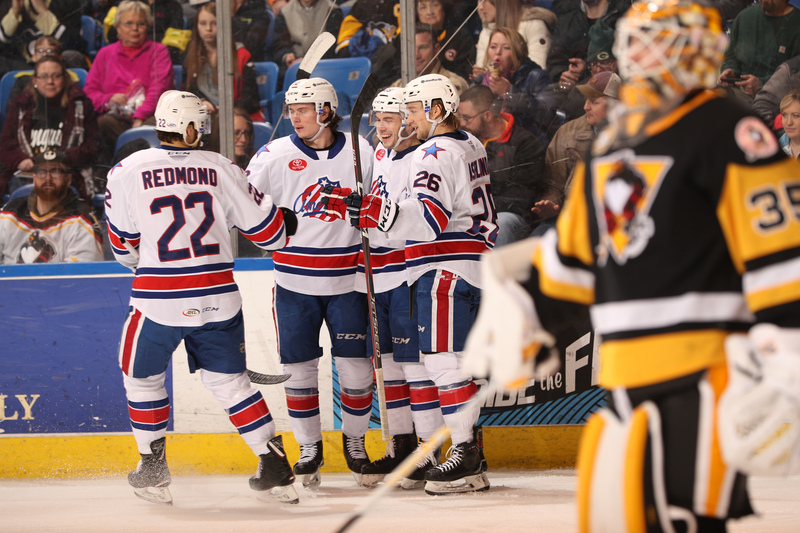 Anthony Angello scored first for the Penguins at 3:29 of the first period but it only took 73 seconds for the Amerks to respond when Zach Redmond scored his 17th goal of the season. An odd man rush at 9:46 of the first period resulted in Jimmy Hayes scoring to give the Penguins a 2-1 lead. The two goals against were results of Matt Tennyson on the first goal taking himself out of the play. The second goal was Brendan Guhle delivering a hit at center ice leaving Andrew MacWilliam alone in the defensive zone. A turning point in the game was at 7:48 of the second period when every Penguins player on the ice went to the bench for a line change. Every player. As they made an attempt to dump the puck into the Amerks zone it landed on the stick of Zach Redmond. He looked up, saw Danny O’Regan all alone, and delivered a perfect long pass. O’Regan scored his 13th goal of the season on the breakaway. The game was tied 2-2 until Zach Redmond scored his 18th goal of the season on the power play. CJ Smith sent a hard crisp pass into the slot where Redmond was ready to shoot for his team lead ninth power play goal of the season. Adam Johnson would score at 14:27 of the second period as both teams played four on four. He scored unassisted on a breakaway as the four Amerks skaters were all caught down low in the Penguins zone. Victor Olofsson took over in the third period to score two goals and secure the win for Rochester. His first goal was was a quick release into the back of the net off of a back hand drop pass from Danny O’Regan. His second goal of the game, and game winning goal, was scored at 14:31 of the third. Alex Nylander entered the zone on the left side, spotted Olofsson ready to shoot and put the puck right where it needed to be. Olofsson went down to one knee to deliver the game winning shot. Anthony Angello would score again with 62 seconds left to get the Penguins within one but the Amerks played a perfect shut down game in the final minute. Zach Redmond finished with 2G+2A and a team high seven shots on net. Scott Wedgewood finished the game with 19 saves for his 15th win of the season. New comer Taylor Leier was reportedly with the team arriving at the end of morning skate and did not play in the game. Sean Malone is still out with a day to day injury and did not make the trip. Nathan Paetsch, Tyler Randell, and Brandon Hickey were the healthy scratches. Rochester is scheduled to play in Allentown, PA against the Lehigh Valley Phantoms on Saturday night. With the incoming snow storm and thruway closures we’ll find out early Saturday if the game is going to be played as scheduled.